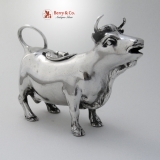 American sterling silver creamer in the form of a cow, Shreve & Co, c.1900. This unusual creamer is 4 7/8" long, 3 3/4" tall and weighs 301 grams or 9.7 ozs Troy. The excellent original condition and clear, crisp detail, with no monograms or removals, repairs or alterations, make this an especially attractive offering. 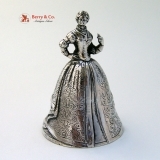 German sterling silver dinner bell in the form of a Victorian lady wearing a hoop skirt, made by B. Neresheimer & Sohne, c.1900, bearing a full set of import Hallmarks for Chester, 1907. This ornate heavy Edwardian bell is 3 1/8" tall, 2 1/8" in diameter and weighs 114 grams or 3.7 ozs Troy. The excellent original condition and clear, crisp detail, with no monograms or removals, make this an especially attractive offering. American sterling silver and cobalt glass open salt dishes, pair, by Gorham Silversmiths, each date marked for 1889. The elongated open work octagonal gilt bodies are decorated with urns surrounded by elaborate foliate scroll work and flute playing hoofed cherubs. The original gilding shows wear consistent with use and age. 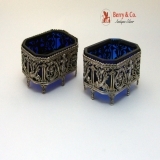 Each elaborately decorated body sit on 8 Acanthus leaf bun feet with the cobalt blue glass liners being in excellent condition. The silver weight of the pair is 122 grams or 3.9 ozs. Troy, with each salt being 3 1/8" long, 2 1/4" wide and 1 1/2" tall. The soft, warm, original finish is present, with no buffing or machine polishing. The excellent original condition and clear, crisp detail, with no monograms, removals, repairs or alterations, make this an especially attractive offering. English sterling silver and steel straight razors, cased pair, by Paul Storr and retailed by Tessiers Ltd of 26 New Bond St, London. This most desirable pair of razors each has a sterling silver housing and a polished steel blade, with each razor being inscribed with a Royal Crown and Wm IV. One side has the Lion Passant, the London town mark Paul Storrâ€²s 9th mark, the other side has the date letter p for 1830 and the Kingâ€²s Head duty mark. There is an old repair to one side on one razor. The set comes in a gilt leather fitted case from Tessiers Ltd of 26 New Bond Street London. The case is in excellent original condition, with light scuffed around the clasp area, as would be expected. Each razor is 5 7/8" long, with the pair weighing a total of 142 grams or 4.6 ozs. Troy. 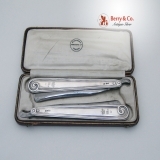 Donâ€²t miss this opportunity to own an exceptional pair of straight razors. 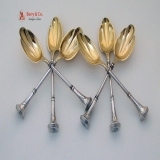 American coin silver set of 6 ice cream spoons with sealed top engraved handles and fluted and gilt bowls, maker′s initials JB, Pat. 1867. These handsome spoons are 5 3/4" long and weigh a total of 151 grams or 4.86 ozs Troy. 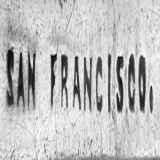 Monogrammed D in a period script. The excellent original condition and clear, crisp detail, with no removals, repairs or alterations, make this an especially attractive offering. 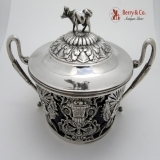 English sterling silver Repousse and cut work large sugar shaker by Sibray hall and Company, Job Frank Hall having a full set of Sheffield Hallmarks for 1897 on the body and the lid. The center of the body has two scroll bordered reserves. One is blank, the other has a family crest of a spread winged eagle atop a globe with the Latin Motto: Nec Temere Nec Timide, which translates: Neither rashly nor timidly. 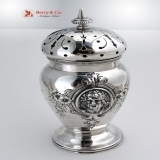 This extraordinary shaker has a bellied body with allover Repousse scroll. foliate and Belleflower decorations and a cut work lid with conforming decorations and an urn finial. it sits on a spread, circular foot with conforming decorations. Weighing 242 grams or 7.8 ozs. Troy, the shaker is 9" tall. Inscribed as described above, the soft, warm, original finish is present, with no buffing or machine polishing. The excellent original condition and clear detail, with no removals, repairs or alterations, make this an especially attractive offering. American sterling silver cut work Baroque scroll rimmed napkin ring by the Whiting Division of Gorham Silversmiths, date marked for 1908. This intricately detailed napkin ring has a body with fancy, scroll cut work decorations and applied, Baroque scroll rims. Weighing 20 grams, this special napkin ring is 1 3/4" in diameter and 1 1/4" tall. The soft, warm, original finish is present, with no buffing or machine polishing. The excellent original condition and clear, crisp detail, with no monograms, removals, repairs or alterations, make this an especially attractive offering. American sterling silver figural sugar tongs in the form of a lobster claw, by Simon Brothers, c.1900. The spring action and hinge are in excellent original condition This unusual device is 4 1/4" long and weighs 33 grams or 1 ozs Troy. The excellent original condition and clear, crisp detail, with no monograms, removals, repairs or alterations, make this an especially attractive offering. American Southern coin silver octagonal trophy cup by Henry Fletcher of Louisville and Lexington Kentucky, c.1853. The cup has Repousse floral and scroll decorations forming a cartouche in which is inscribed: Capt A.C. Harig of Washington Guards to W Haberer for the best Shot Nov. 14th 1853. Augustus C. Harig was a partner in the Louisville firm of Harig and Jones lock and safe-makers. They held several patents for improvements on locks and safes. Applied beaded upper and lower borders add to the appeal of this historically significant cup. This beautiful cup is 3 1/4" tall, 3 7/8" across the handle, 2 7/8" in diameter and weighs 86 grams or 2.8 ozs Troy. The excellent original condition and clear, crisp detail, with no removals, repairs or alterations, make this an especially attractive offering. The soft, warm, original finish is present, with no buffing or machine polishing. 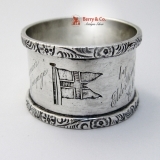 English sterling silver souvenir napkin ring from the Elder Dempsterâ€²s R.M.S. Jebba by Walker and Hall, having a full set of Sheffield Hallmarks for 1905. The Jebba was wrecked March 18, 1907. CLICK HERE for more on the R. M. S. Jebba Inscribed with the Elder Dempster Flag and the inscription: Souvenir of Voyage by Elder Dempsterâ€²s R.M.S. Jebba. This interesting napkin ring is 1 7/8" in diameter, 1 1/8" tall and weighs 31 grams or 1 oz. Troy. The Hallmarks are slightly rubbed but still legible, otherwise: Inscribed as described above, the soft, warm, original finish is present, with no buffing or machine polishing. The excellent original condition and clear detail, with no removals, repairs or alterations, make this an especially attractive offering. 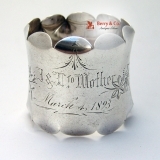 American sterling silver napkin ring having pinched petal edge rims and a floral engraved body inscribed: J & L to Mother March 4 1893. This large attractive napkin ring is 2" in diameter, 1 7/8" tall and weighs 49 grams or 1.6 ozs. Troy. Inscribed as described above, the soft, warm, original finish is present, with no buffing or machine polishing. The excellent original condition and clear detail, with no removals, repairs or alterations, make this an especially attractive offering. 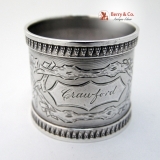 American coin silver napkin ring having an Acorn and Oak Leaf and Branch engraved body with applied shaped bud rims. The shaped cartouche contains the inscription: Crawford. Marked S 640 and weighing 38 grams or 1.2 ozs. Troy, this handsome napkin ring is 1 3/4" in diameter and 1 1/2" tall. Inscribed as described above, the soft, warm, original finish is present, with no buffing or machine polishing. The excellent original condition and clear detail, with no removals, repairs or alterations, make this an especially attractive offering. Russian 84 standard silver Art Nouveau napkin ring having wavy scroll bordered faces of a boy and girl, assayed in Moscow between 1908 and 1917, maker′s mark ÐŸÐ or PA in Latin letters. This special oval napkin ring has a gilt interior and is 2 1/8" - 1 3/8, 1 3/4" tall and it weighs 51 grams or 1.6 ozs. Troy. The soft, warm, original finish is present, with no buffing or machine polishing. The excellent original condition and clear, crisp detail, with no monograms, removals, repairs or alterations, make this an especially attractive offering. 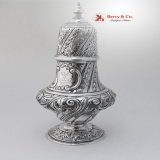 American 900 Silver sugar shaker in the Medallion pattern by Wood and Hughes, c.1870. This handsome shaker is 5 3/8" tall, 3 3/4" across the handle and weighs 122 grams or 3.9 ozs Troy. Monogrammed BC EC. The excellent original condition and clear, crisp detail, with no removals, repairs or alterations, make this an especially attractive offering. Inscribed as described above, the soft, warm, original finish is present, with no buffing or machine polishing. American coin silver set of 5 teaspoons in a Fiddle pattern, marked San Francisco, probably Lawler, c.1860. 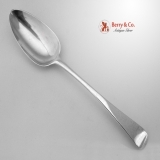 These elegant spoons are 6" long and weigh a total of 103 grams or 3.3 ozs Troy. Monogrammed Shaw on the back of the handle. Some dimples in the bowls. American Federal coin silver sauce ladle possibly by Isaac Woodcock or Joseph Warner, both of Wilmington Delaware, c.1800, maker′s mark I*W. This desirable sauce ladle is 5 1/2" long and weighs 20 grams. 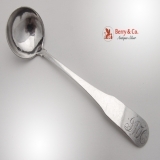 It has an ornate, period script monogram on the front of the handle: JMH. Monogrammed as described above, the soft, warm, original finish is present, with no buffing or machine polishing. The excellent original condition and clear detail, with no removals, repairs or alterations, make this an especially attractive offering. American or Scottish late 18th Century tablespoon with a double struck maker′s mark MF. A nice Mystery spoon that is 8 1/2" long and weighs 55 grams or 1.8 ozs. Troy. Possible maker′s are Michael Forrest of Cannongate, c.1770 or Patrick McFarlane of Glasgow, c.1781.It is more likely an American spoon, as there are only the two identical marks and the mark is rather crude. The form dates from 1760 - 1790. The soft, warm, original finish is present, with no buffing or machine polishing. The excellent original condition and clear, crisp detail, with no monograms, removals, repairs or alterations, make this an especially attractive offering. English sterling silver shell form serving bowl by Henry Atkin having a full set of Sheffield Hallmarks for 1905. This large, elegant open work floral Repousse shell form bowl has a deeply fluted body with a pie crust edge and sits on three shell feet. Weighing 315 grams or 10.1 ozs. Troy, this elegant bowl is 10 1/4" - 8 3/4" and 3 1/2" deep. The soft, warm, original finish is present, with no buffing or machine polishing. The excellent original condition and clear, crisp detail, with no monograms, removals, repairs or alterations, make this an especially attractive offering. 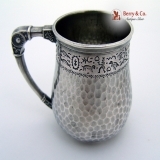 American sterling silver hammered baby cup with embossed American Indian motif decorations, c.1884. 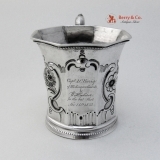 This darling cup is 2 3/4" tall, 3" across the handle and weighs 80 grams or 2.6 ozs Troy. the cup has some engravings on the bottom of the cup. Excellent original condition save for some dents on the handle consistent with age and use. American sterling silver pair of figural open salt dishes in a form of an egg shell, Gorham Silversmiths, date marked B for 1869. These beautiful dishes are 1 1/4" tall, 1 1/2" in diameter and weigh a total of 28 grams. Monogrammed TRW Nov 4 1870. The excellent original condition and clear, crisp detail, with no removals, repairs or alterations, make this an especially attractive offering. 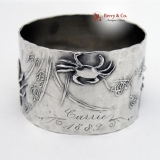 American coin silver napkin ring with three applied crabs and acid etched sea weed decorations, c.1889. 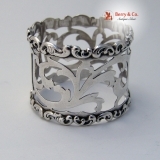 This beautiful napkin ring is 1 7/8" in diameter, 1 1/4" tall and weighs 53 grams or 1.7 ozs Troy. Inscribed Carrie 1889. The excellent original condition and clear, crisp detail, with no removals, repairs or alterations, make this an especially attractive offering. 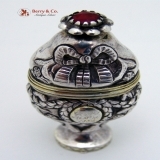 Antique Continental 800 - 830 standard silver double compartment spice box with a ruby red glass finial, 1796. This unusual box is 3 1/8" long, 1 3/8" wide and weighs 41 grams. Inscribed in two place: on the bottom of the foot: PTS EPD 1796; and on the front cartouche: CAS MPS 1852. The excellent original condition and clear, crisp detail, with no removals, repairs or alterations, make this an especially attractive offering. American sterling silver round pill box with applied figures in a Japanesque style, Wallace, c.1885. 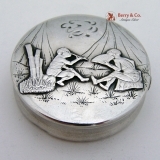 This beautiful box is 2 1/4" in diameter and weighs 35 grams or 1.12 ozs Troy. The excellent original condition and clear, crisp detail, with no monograms, removals, repairs or alterations, make this an especially attractive offering. Continental silver covered bowl with cobalt glass liner, cow finial, swan head handles, c.1880. 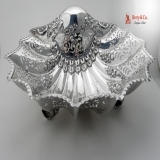 This beautiful bowl is 7 1/4" across the handles, 4" tall, total silver weight is 341 grams or 11 ozs Troy. The excellent original condition and clear, crisp detail, with no monograms, removals, repairs or alterations, make this an especially attractive offering. 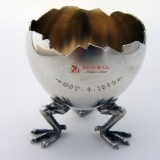 American sterling silver figural egg cup by Gorham Silversmiths, date coded B for 1869. 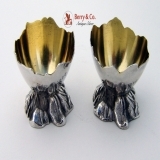 This whimsical and useful egg cup has a cracked eggshell body with a gilt interior and sits on three chicken leg form feet. Weighing 52 grams or 1.7 ozs. Troy, this special egg cup is 2" in diameter and 2 3/4" tall. Monogrammed TRW and dated Nov 4 1870. The soft, warm, original finish is present, with no buffing or machine polishing. The excellent original condition and clear, crisp detail, with no removals, repairs or alterations, make this an especially attractive offering. 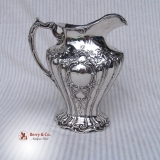 American sterling silver water pitcher in the Chantilly Grand pattern by Gorham Silversmiths, date marked for 1907. 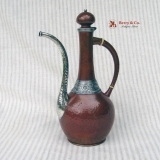 This beautiful pitcher is 10" tall and weighs 1161 grams or 37.3 ozs Troy. It is pattern number A580 and has a capacity of 4 pints. The soft, warm, original finish is present, with no buffing or machine polishing. The excellent original condition and clear, crisp detail, with no monograms, removals, repairs or alterations, make this an especially attractive offering. Available elsewhere for $4000, our price of $3500 is as special as the pitcher itself. English Georgian pair of sterling silver covered dishes with gadrooned borders, bearing a full set of hallmarks for London 1809 by T & J Guest & Joseph Craddock. 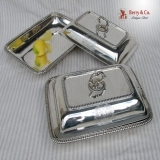 These elegant dishes are 11 3/4" long, 8 3/4" wide, total silver weight is 4001 grams or 128.6 ozs Troy. The soft, warm, original finish is present, with no buffing or machine polishing. The excellent original condition and clear, crisp detail, with no monograms, removals, repairs or alterations, make this an especially attractive offering. 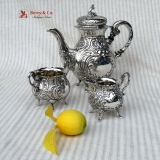 Swedish 830 Standard silver ornate coffee set, date marked for 1952. This beautiful set is: Coffee pot 9" tall, sugar bowl is 3 7/8" tall, creamer is 3 1/2" tall, total silver weight is 2430 grams or 78.1 ozs Troy. The soft, warm, original finish is present, with no buffing or machine polishing. The excellent original condition and clear, crisp detail, with no monograms, removals, repairs or alterations, make this an especially attractive offering. American sterling silver and copper Turkish coffee pot by Gorham Silversmiths, date marked for 1883. This beautiful pot is 13 1/8" tall, about 7" spout to handle. Monogrammed on the bottom of the pot JST in an ornate period script. The soft, warm, original finish is present, with no buffing or machine polishing. The excellent original condition and clear, crisp detail, with no removals, repairs or alterations, make this an especially attractive offering. 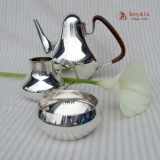 Danish sterling silver three piece coffee set by Georg Jensen, designed by Henning Koppel, c.1950. This elegant set measures: Coffee pot is 6 1/2" tall, creamer is 3" tall, sugar bowl is 1 3/4" tall, total silver weight is 1163 grams or 37.4 ozs Troy. The soft, warm, original finish is present, with no buffing or machine polishing. The excellent original condition and clear, crisp detail, with no monograms or removals, repairs or alterations, make this an especially attractive offering.